… and looking back on all of our recipes from this year, to see which of our new “babies” were your favorites! Just like any proud mamas, it’s practically impossible for us to look at all of our new recipes and pick favorites, so we always just let the numbers do the choosing for us. 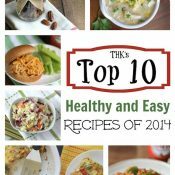 Based purely on which recipes were most frequently viewed by readers, we’ve calculated our 10 most popular healthy, easy recipes of the year. Gretchen was convinced she could make a quick, easy Chicken Caesar Sandwich recipe that DIDN’T involve a bottle of Caesar salad dressing. And she succeeded! 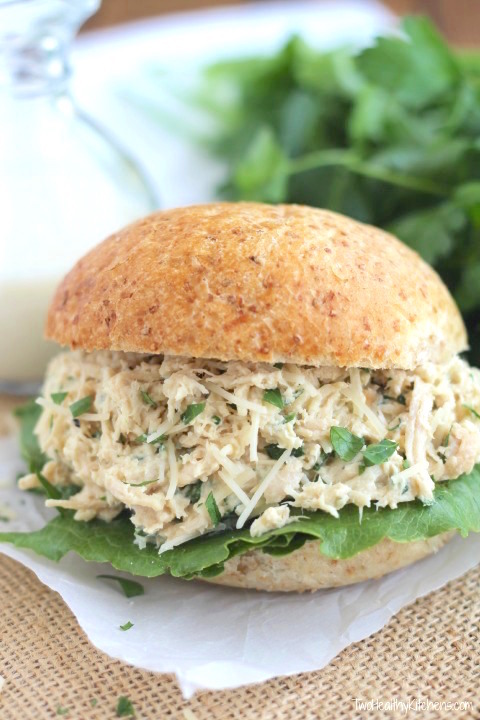 These sandwiches are so simple to make, absolutely delicious … and so much healthier, too! It’s easy to see why they were the runaway favorite recipe we posted in 2015! 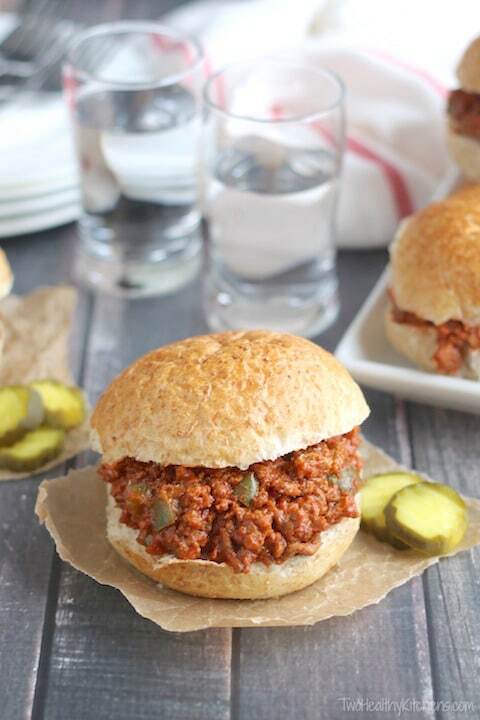 Both of our families agree – this sloppy joe recipe is absolutely the best ever! It’s so much better (and healthier!) than the canned stuff. Plus, it’s really easy for hectic weeknights, and you can even make it ahead! 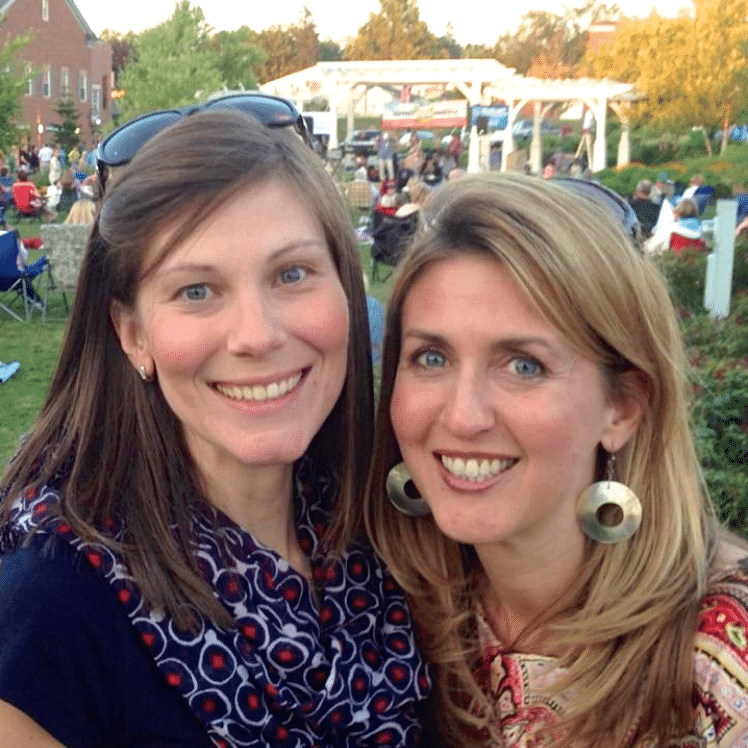 We love versatile recipes, and clearly our readers do, too! This chicken salad is completely at home as a picnic salad or brown bag sandwich … but it also dresses right up for a ladies’ tea. We’ve even got great ideas for serving this as an appetizer (hello, schwanky endive spears!). 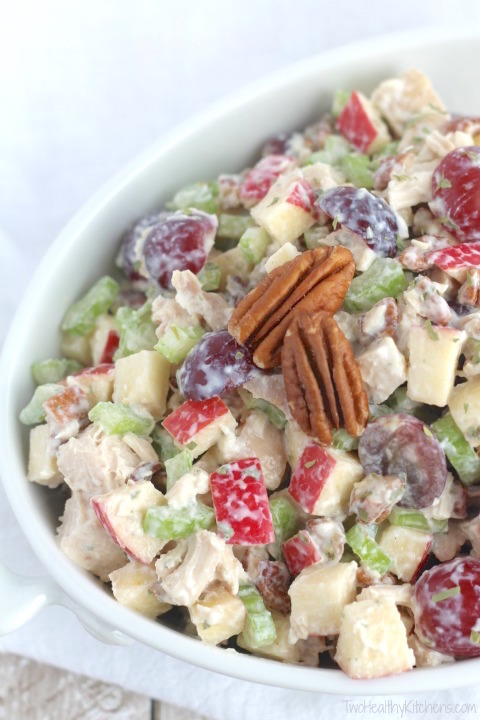 In addition to juicy grapes, crisp apples, and crunchy pecans, it features a you’d-never-guess-it’s-healthy dressing … and a not-to-be-missed secret ingredient! 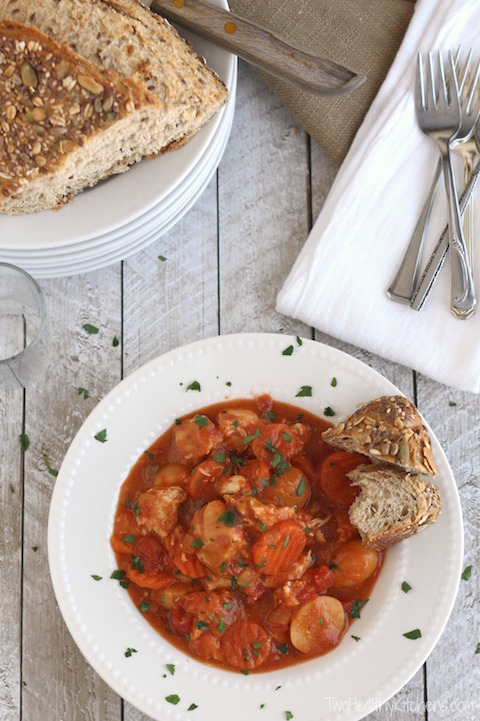 This chicken stew has been a regular feature on Shelley’s table for years. 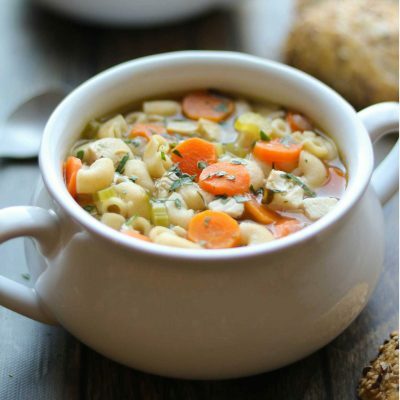 From its humble beginnings as a classic beef stew, this recipe gradually evolved into a much healthier (THK-worthy! ), but equally delicious chicken version. 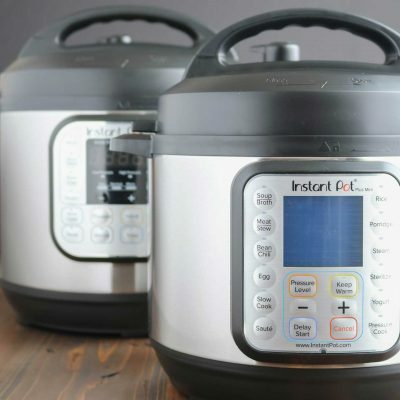 It’s extra-easy with pantry staples and your slow cooker! 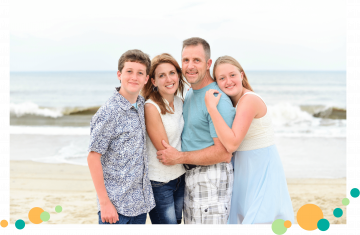 A long-time favorite with Gretchen’s family, our readers fell head-over-heels in love with this, too! 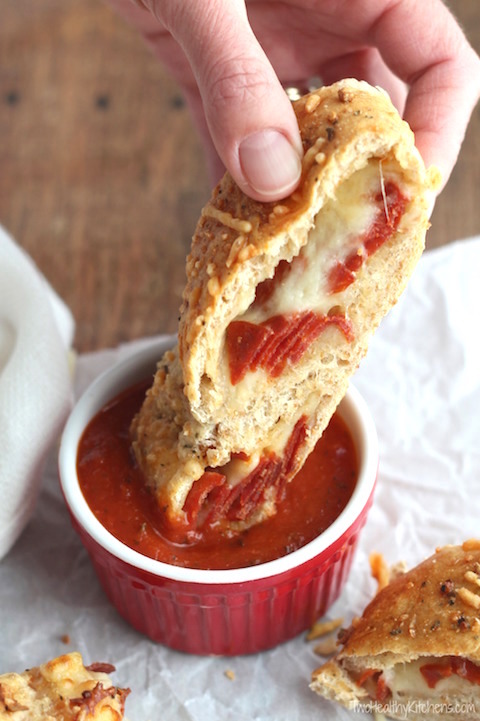 It’s a quick, fun, nutritious option for family pizza night, and also a perfect appetizer for parties! We originally published this recipe as part of the cookbook, “Where Slow Food and Whole Food Meet,” featuring easy, healthy recipes from top bloggers. (Psssst … if you haven’t gotten your copy of the cookbook yet, just subscribe to our newsletter and we’ll send you a free download!) 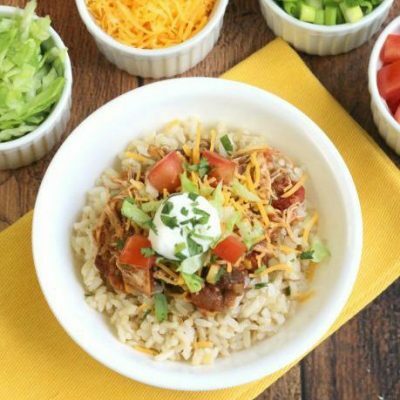 These burrito bowls will be your new go-to for a Mexican feast on even the busiest nights! 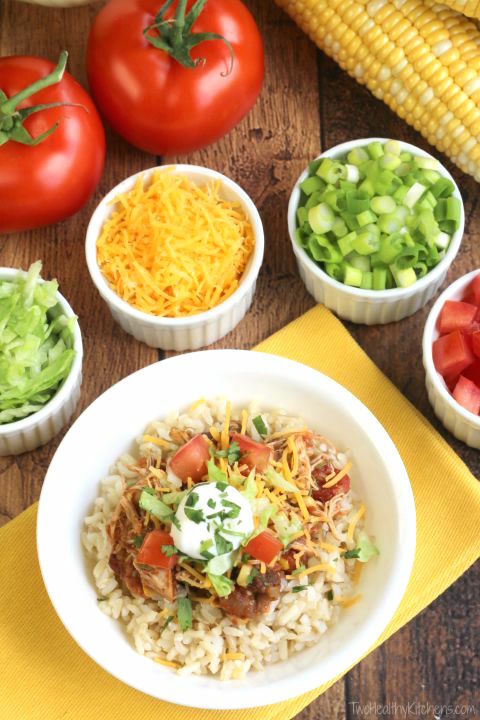 Plus, this slow cooker recipe is perfect for parties, tailgating, potlucks, and make-your-own burrito bars! 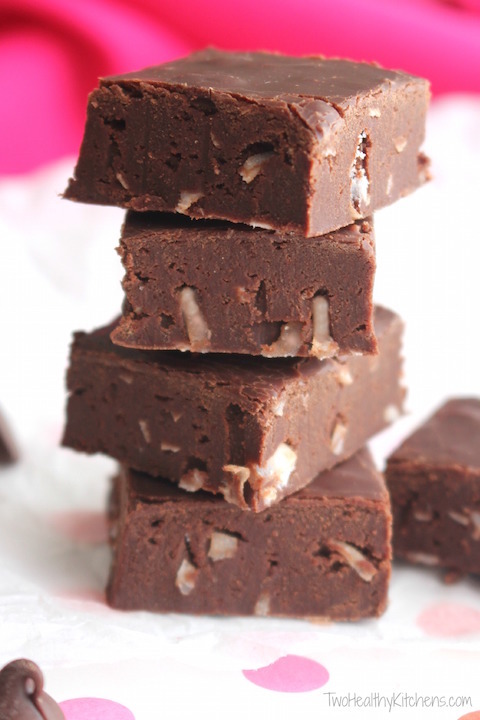 This incredibly easy fudge recipe takes just 5 minutes to prep! Bonus: there’s no butter, and this recipe skips the loads of extra sugar and sweetened condensed milk you typically see in traditional fudge recipes! Yet it’s still deeply, richly, darkly chocolatey … you’ll never miss those naughty ingredients at all! 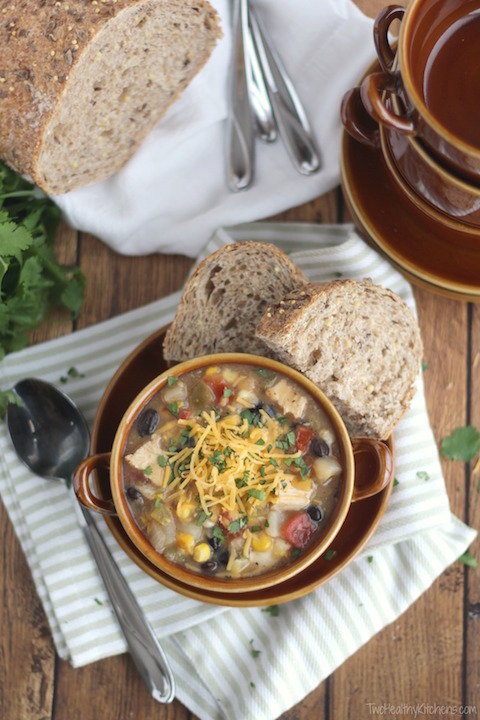 This slow cooker soup is a yummy, kicky spin on a comfort food classic. Loaded with sweet corn, plus southwestern flair from green chiles, salsa, and black beans – delicious and not too spicy. 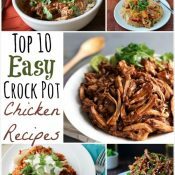 And so simple – you just mix everything together right in your slow cooker! These super-fast, heart-healthy burgers are incredibly delicious, and a perfect make-ahead weeknight dinner. 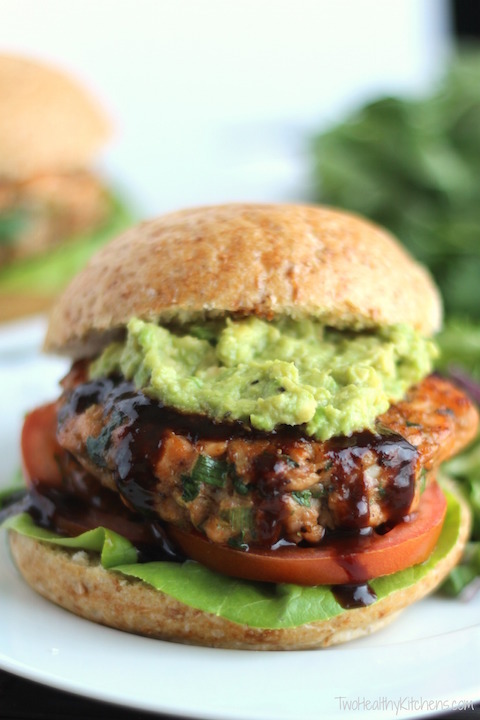 Bursting with Asian flavors, they’re topped with hoisin sauce and rich, creamy avocado! 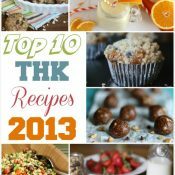 As hard as it is for us to pick favorites, every year we each choose one more recipe that we kinda think should have been in the Top 10 (teehee – our little way of getting 12 of our babies into a post that’s supposed to feature just 10)! 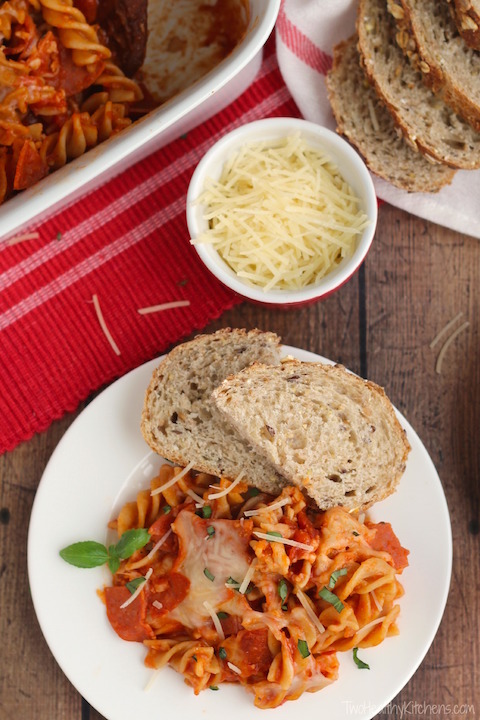 This pasta bake is perfect for those crazy-busy weeknights where dinner needs to come together in a flash! It requires no pre-boiling (or even a separate bowl to mix in!) and is ready in no time! 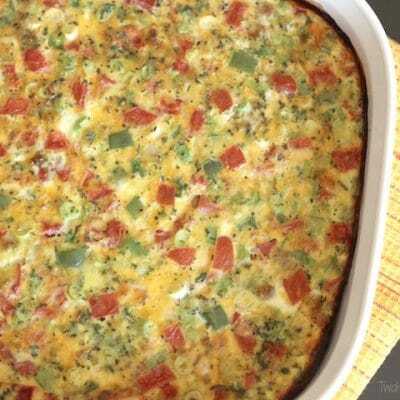 Bonus – it’s the perfect dish to share with family, friends, new moms … everyone! 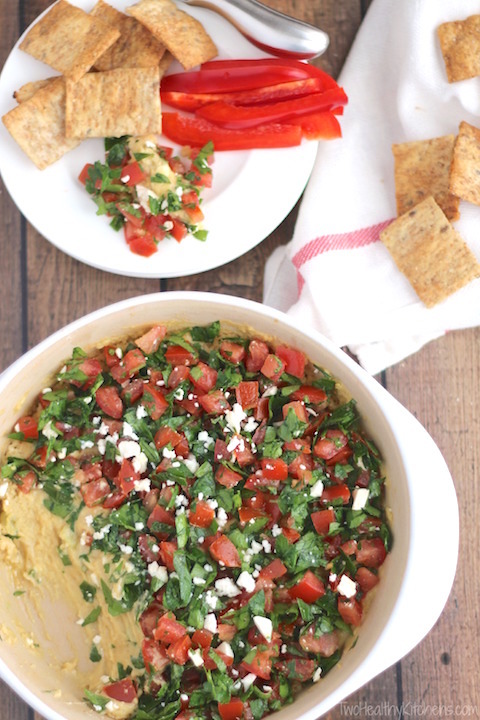 This gorgeous dip combines two of Shelley’s Mediterranean favorites – a warm, creamy hummus layer is topped with a fresh, cool tabouli. It’s such a quick and simple appetizer to whip up for parties, and it wins raves every time! Happy, happy New Year, THK friends! We’ve had such fun sharing easy, healthy, delicious inspiration with you this year … and are so thankful that you’re here with us, every step of the way! As the years go by, we’ll pop back to update this post, since we thought you might like to be able to check out some of our other most popular recipes from various years. 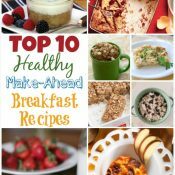 Lots and lots of easy, healthy recipes you’ve just gotta try next! Enjoy! What a beautiful roundup, and such diversity of flavors! I want that chicken pot pie caesar sandwich in particular. Yum! They all look good, but that pepperoni bread and salmon burger are callin’ ma NAME!! No you’re making me hungry! I want to make every single one of these recipes, they look amazing! I need the sloppy joe recipe. My husband loves them and I’ve never really made them. I think I need to change that (though every recipe on here looks amazing). What a great year, everything looks so delicious! So many delicious recipes here! I’m starting with the Salmon burgers – those are calling my name!! 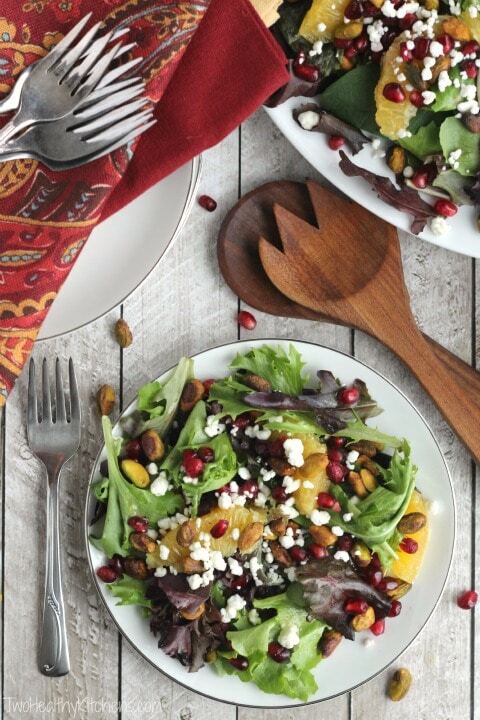 Ooh that Christmas salad is calling my name! These all sound so great, I think the “Gretchen’s Pick: Easy, Cheesy 5-Ingredient Pizza Pasta Bake” is my favorite though! I love that it’s only 5 ingredients so it’s perfect for my busy schedule! 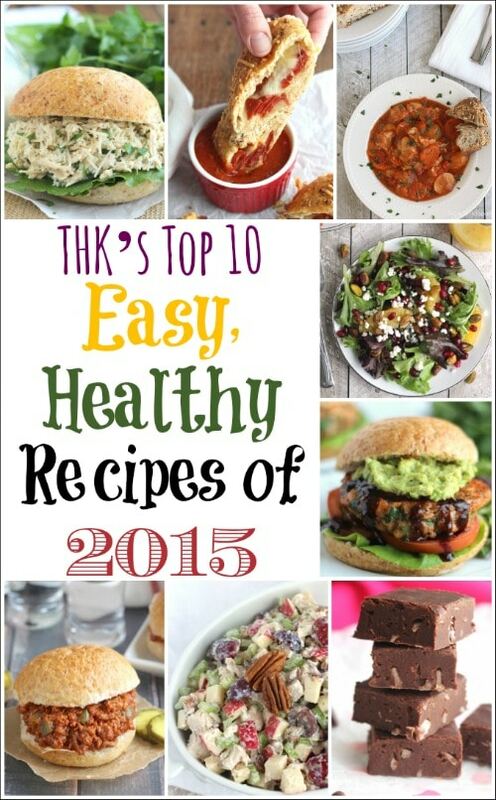 And yes, I love all of the Top 10 Easy Recipes of 2015!! But I also very much enjoyed the Easy Honey-Glazed Salmon and the Stovetop Vegetarian Chili with Red Peppers, Corn and Black Beans! !